During the first observation the X-ray emission can be fully described by emission from a standard accretion disc. Astronomers have taken an unprecedented look at the superenergetic jets blasted out by black holes, and thus have answered a key question about the composition of these mysterious beams. Scientists found evidence of nickel and iron in the jets emitted by a relatively small black hole, suggesting that "normal" matter plays a bigger role in these enigmatic structures than does exotic antimatter. "Until now, it wasn't clear whether the positive charge came from positrons, the antimatter 'opposite' of electrons, or positively charged atoms," Miller-Jones added. "Since our results found nickel and iron in these jets, we now know ordinary matter must be providing the positive charge." This is a model of the black hole system with the jets that have been found to contain atomic matter. 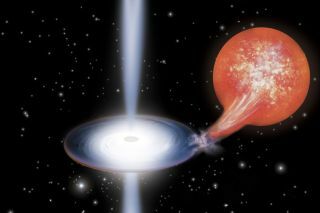 The researchers took the measure of 4U1630-47, a black-hole candidate just a few times more massive than the sun. They studied the object's X-ray emissions using the the European Space Agency's XMM-Newton satellite and analyzed the black hole in radio wavelengths using the Australia Telescope Compact Array system. During the second observation the appearance of a jet is detected in radio emission and the X-ray spectrum requires an additional component attributed to coronal emission above the disc and three narrow emission lines indicating the presence of baryons. The radio observations keyed the team in to the sudden appearance of the jets, while XMM-Newton's data revealed emission lines in the jets' X-ray spectrum corresponding to iron and nickel. Further, these lines were shifted significantly, much as the sound from a siren changes pitch when a fire truck or ambulance approaches and then passes an observer, researchers said. "It led us to conclude the particles were being accelerated to fast speeds in the jets — one directed towards Earth, and the other one in the opposite direction," co-author Simone Migliari, of the University of Barcelona, said in a statement. The team calculated the mind-blowing velocity of the narrowly focused jets to be about 66 percent of the speed of light, or 440 million mph (708 million km/h). Because positively charged atoms are much heavier than positrons, the jets are likely carrying a great deal more energy away from the black hole than previous studies had been able to confirm, researchers said. The new findings also could help answer another long-standing mystery about black-hole jets: the location from which they are launched. Some astronomers think jets are powered by the spin of their host black holes, while others posit that they spring from the disk of material that surrounds and feeds these light-gobbling monsters. "Our results suggest it's more likely the disk is responsible for channelling the matter into the jets, and we are planning further observations to try and confirm this," Miller-Jones said.